Playing with building blocks is an extraordinarily important learning opportunity for preschool aged children. Recent research demonstrates that playing with building blocks is fundamental for later success with learning numbers and math concepts. Researchers have proved that playing with building blocks between the ages of 3 and 5 years of age will do better with math at all levels up to middle school algebra. Toddlers: building blocks play introduces toddlers to cause and effect as they fill containers and then dump the blocks out. Bright colors stimulate them visually and they will experiment by banging them together to produce different sounds. Comparing the different sizes of blocks and ordering blocks by shape and color teaches children how to differentiate geometric patterns in the environment. By stacking blocks toddlers learn about weight and balance. Three year olds: at this age children begin assembling simple structures like roads, towers, farms, and houses. Three year olds are learning how to sort, order by difference/similarity, and how to create something physical from an imaginative concept. Ages Four to Five Years: At this stage playing with building blocks is much better developed, organized and coordinated. Four and five year olds will now combine structures to create complex, interrelated groups. This age group enjoys constructive play and develops socially by sharing ideas with other children and cooperating in group imaginative play. How to Encourage Block Play at Different Ages? Toddler Environment: for toddlers, building blocks should be set up in a distraction free area and away from interruption. The blocks they use should be large and non-interlocking for their safety from choking risks. Toy people, vehicles, and animals should be included to expand play options. Preschooler Environment: Space in a preschool classroom for building block play is should provide space for constructive play where larger, more complex structures can be made and with three or more children working together. This age group will play much more loudly and enthusiastically so it’s better to locate block play in the one of the more active area of the classroom. What happens if you put that block there? Which tower is bigger/smaller, wider/narrower? 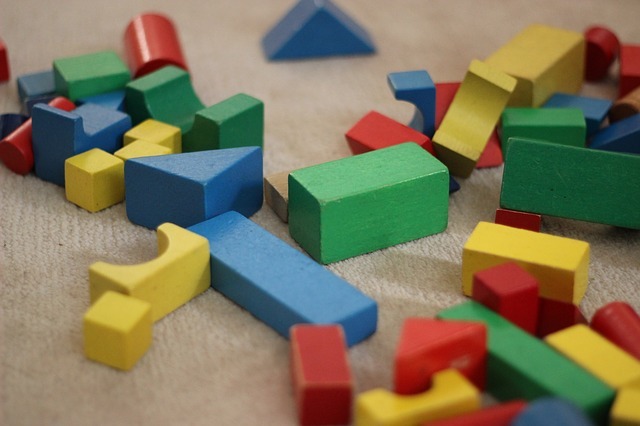 Building blocks are an important part of a child’s play environment. Regular play with blocks from an early age will ensure that your child learns important mathematical and relational concepts that will help them academically later on.